This bright and cheery bungalow is surprisingly feature-rich, given its economical size. Ideal as a first home, a down-sizer for baby boomers, or a vacation property, this little charmer fits many of life’s circumstances! 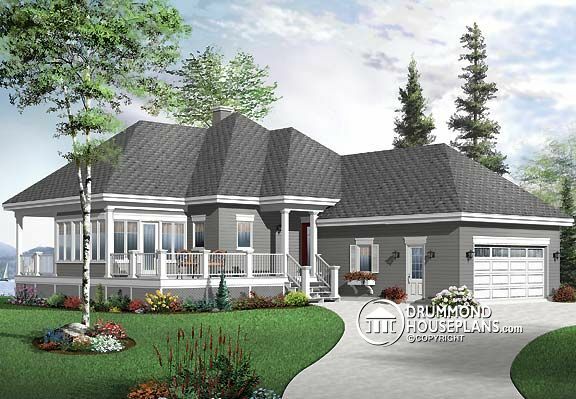 The entry area welcomes visitors with a front porch, promises of conversation on the deck and covered entryway. A double garage allows for ample parking and storage and easy access for getting groceries to the kitchen. With 9’ ceilings, an open concept living area, and abundant windows, size does not seem to matter in this cozy home. The living room is oriented to enjoy the back yard thanks to ample windows and direct access to a covered deck. The dining area transitions easily to a sunroom whose doors open forward and back to allow an easy outdoor extension of living space. Included on the main floor is a master suite including a bank of closets and private bathroom with double vanity and an oversize shower. A second bedroom at the front of the house has a bathroom conveniently located for access from the bedroom as well as for guests. If desired, the front bedroom could be repurposed as an office. Additional bedrooms can be added to the unfinished basement during construction or as the need arises. Options abound! ← Previous Post: Housing Future – Bullish or Bearish?